Commons Health was established to advance the essential ecological principles that underlie health and which are underpinning the transformation of healthcare, economics, and foods systems back into realignment with Earth's operating system. We do so by linking and networking transformational place-based models and through education and training are building a global community of practice. We believe a new operating system embodied in systems thinking is fundamental to our journey through the Great Transition as it and brings shifts in perception that will positively influence health and support our collective ability to be alive and well together. A systems worldview implies the vital importance of “power within,” social relationships, and connection, and embraces the interplay of psycho-social, spiritual, environmental, and other factors in the support and promotion of individual health and well-being. 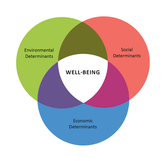 We appreciate the significance of our intimate relationship to social, environmental and economic influences of well-being which help us embrace the recognition that ultimately health and "being alive well together" is local. Join a community of practice, and learn key tools and strategies to help co-create place-based models of well being, a new health operating system and evolve shared knowledge, experience, communication and collaborations. 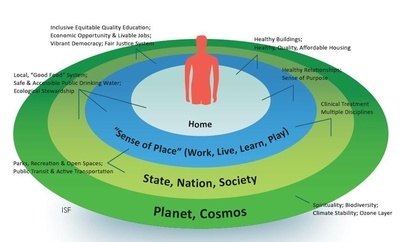 Health Commons and our "Sense of Place"
A Health Commons is a conceptual model which includes the collective resources within a defined geographic boundary. These include those that treat disease (the care system) and importantly the social, environmental and economic drivers which are largely responsible for "creating" health and well-being. These health drivers, or systems, are relationship based and include healthy food systems, access to drinking safe drinking water, safe and affordable housing, livable jobs, parks, a sense of connectedness, an ability to effect change, spirituality and more. A health commons is closely aligned with our "sense of place". Watch The Ecology of Health travel on a unique journey from our cells to our community to our planet to our cosmos. 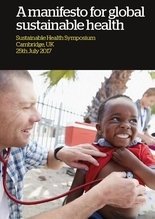 Join us July 29th, 2017 in London, UK for a conversation about health creation and the Food Commons. Read our latest paper The Next Health System, by Commons Health founder Jamie Harvie. Commissioned by the Next System Project, it offers a holistic vision and compelling path through the Great Transition. New Accountable Communities Conference Reports: Explore important takeaways from our recent conference (pdf) and learn key next steps in the companion document (pdf). Radical Redesign and the Door to Transformation: ABIHM blog on Commons Health linking CHNA, GMO's, Anchor Institutions and healthcare. Huffington Post Article: The Commons Health Hospital Challenge was called out in a great Huffington Post article by Dr. Jeff Ritterman. Click here. This is a great opportunity to get more clinicians and citizens to add their name in support of the Hospital Challenge (or learn more) here per the Huffington Post article suggestion. Event: on 02/04/14 The Great North, A Minnesota Chapter of the American Holistic Nurses Association hosted the workshop, Our Common Health: The Rise of an Integrative Approach to Health Policy and Prevention on the campus of St. Scholastica, in Duluth, MN. Jamie Harvie was the featured speaker. The presentation was followed by relationship building among attendees. See flyer here.